The Vienna Symphony (German: Wiener Symphoniker) is an orchestra in Vienna, Austria. The orchestra was formed in 1900 by the conductor Ferdinand Löwe. It was then called the Wiener Concertverein (Vienna Concert Society). 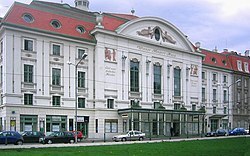 In 1913 it moved into the Konzerthaus, Vienna. In 1919 it joined with the Tonkünstler Orchestra. In 1933 it got the name it has today: Vienna Symphony (Wiener Symphoniker). During World War II the Nazis forced them to be part of the German Culture Orchestras and they were used for propaganda. They stopped playing in 1944. Their first concert after the war was on 16 September 1945, when they performed Gustav Mahler's Symphony No. 3. Their conductor Josef Krips quickly helped them to become a great orchestra. From 1946 they were often conducted by Herbert von Karajan who toured with them throughout Europe and North America. In 1959 the VSO performed for Pope John XXIII at Vatican City. When Wolfgang Sawallisch became their conductor he toured with them to the United States and Japan. Today Fabio Luisi is their chief conductor. This page was last changed on 29 January 2018, at 08:51.